In the “In the Spotlight” series, we ask a number of reliable WordPress agencies and Savvii clients about what they excel in. We hope to help people in their search for a WordPress specialist of their choice, and at the same time we can give developers a sneak peek of each other’s work. This edition discusses the full-service WordPress agency Stuurlui from Utrecht. We spoke to one of their founders, Sjoerd Kuipers. Please read the other installments of this series as well. Stuurlui is a full-service WordPress agency from Utrecht. We design, build, and maintain custom WordPress websites. At the moment, our experienced team consists of 18 members. We are small enough to shift focus quickly and large enough to house specialists in all areas. We are strong on a technical level. We love technical challenges with API connections, among other things, but we handle more than just technical matters. We also support companies with their online marketing activities. The fact that we are knowledgeable about both web development and online marketing makes us an attractive partner for marketing departments. Why do clients choose Stuurlui specifically? Clients mainly choose us because of our WordPress knowledge, both on a technical and on a marketing level. Clients can call on us for the full service. That wide range of skills is appreciated. We notice that we are increasingly being seen as one of the most reliable WordPress partners in the Netherlands, besides a few other top clubs. In general, our work method is very pragmatic. We always thoroughly define the specifications of the project before making a price quote. This pragmatic view enables an efficient partnership. We also invest a lot in service and support after the project goes live. Every request made before 4:30 p.m. is picked up by our support desk on the same day. After a project goes live, we still meet with our clients on a regular basis to see how the website can be further improved. How did you end up building WordPress websites? One of our founders, Hans, was already building WordPress websites. He already had a lot of experience with this and saw that WordPress would be the CMS of the future. That is why we started focusing on that when we founded Stuurlui. He turned out to be right. We can clearly see that major companies have also started using WordPress. The government is also starting to realize that WordPress is a smart alternative. WordPress has clearly left the “blog-o-sphere” and is being used by increasingly larger companies. What are the topics that are most commonly featured with clients? Digital Accessibility is an important topic at the moment. 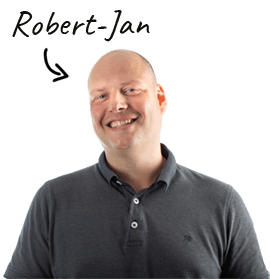 We recently discussed at the WordCamp Utrecht, for example. Recently, we conducted a large study that was published by Emerce, among others. It shows that one in four people in the Netherlands has a disability. This group of people needs and is entitled to easily accessible internet. As of 2019, this will even be legally required for state institutions! This is an important topic, one that we at Stuurlui work on a lot. Furthermore, we keep innovating. We have done a lot with the GDPR the first six months and now we are investigating what we can do with voice search, This already encompasses 20% of the search traffic in the USA. We see that mostly larger companies with an internal marketing department contact us. Specifically, we work a lot with (semi-) government officies, recruitment companies, and charities. A pretty diverse group with a collective need. WordPress is the ideal solution for the online challenges they have. Those challenges can be considerably complicated as far as we are concerned. We will find a way. That being said, we particularly enjoy it when get to do things we have never done before. To most clients, we say: “Take Savvii, because it will turn out great”. That summarizes the partnership pretty well, I think. What does your work flow look like? That is one of our strengths, we have put a lot of thought into this. A potential new project always starts with a personal meeting. During that conversation, we figure out what a project would encompass down to the smallest detail. We take our time for this so that we will never encounter any surprises down the line. For example, we will occasionally instruct a developer to figure out what the current environment looks like at a client’s office for an entire day. That way we will not need to argue about the scope of the project at a later time. This works much more agreeable way to work for all parties involved. The partnership therefore already begins before we make the price quote. After that, we have a joint kick-off meeting. In this meeting, we discuss, among other things, the aims of the website, the intended public, and what sets the customer apart in its market segment. When that is clear, we construct the wireframes and when these are approved, we will “fill” them: developing the designs of the different pages. When the customer is satisfied with the designs we have made, the technical development begins. At the same time, we start the training programs to fill out the content of the website. When the content is published, we test until everybody is satisfied and launch the website subsequently. Afterward, we reach an agreement on hosting and maintenance services with the client. We take care of all back-ups, the updates of the software, and we ensure that the website will be properly maintained by us. One of our goals for next year is to meet more regularly with more clients to further develop their websites. That way the strategic partnership we have built will be further expanded. We have been working together for a couple of years now. What do you like most about the partnership? We offer clients two types of hosting: a basic package for clients who do not put great demands on the website. When that is the case, we work with Savvii. I can be brief about the partnership: It is relaxed and very pleasant. They deal with questions in a quick and sufficient manner, and we notice that we are on the same wavelength. I find the quality of the service even more important: it is exceptionally well. We have never had any issues and the speed of the websites we deliver is truly amazing. To most clients, we say: “Take Savvii, because it will turn out great”. That summarizes the partnership pretty well, I think. Stuurlui is not the only one who thinks working with us is the smart thing to do. Read about other agencies we’ve spoken with.